Implementing changes cannot be started simply after identifying the objectives and end state. It needs an organized assessment to weigh every factor involved in making the change. The Beckhard and Harris change equation is a simple but useful tool for such an aim. It was actually first created by David Gleicher in the 1960s, but gained popularity when Richard Beckhard and Reuben Harris attributed it to him on their book “Organizational Transitions”. In this course, the participants will be able to learn to create their own change equations which can be used in their respective industries. It will also teach them to analyze the factors involved before diving into implementation. 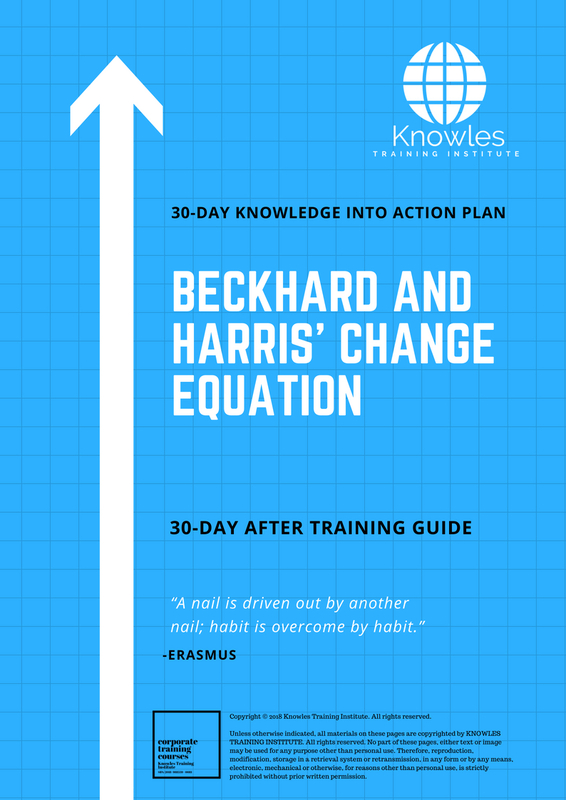 This Beckhard And Harris’ Change Equation workshop is ideal for anyone who would like to gain a strong grasp and improve their Beckhard And Harris’ Change Equation. The duration of this Beckhard And Harris’ Change Equation workshop is 1 full day. Knowles Training Institute will also be able to contextualised this workshop according to different durations; 2 full days, 1 day, half day, 90 minutes and 60 minutes. 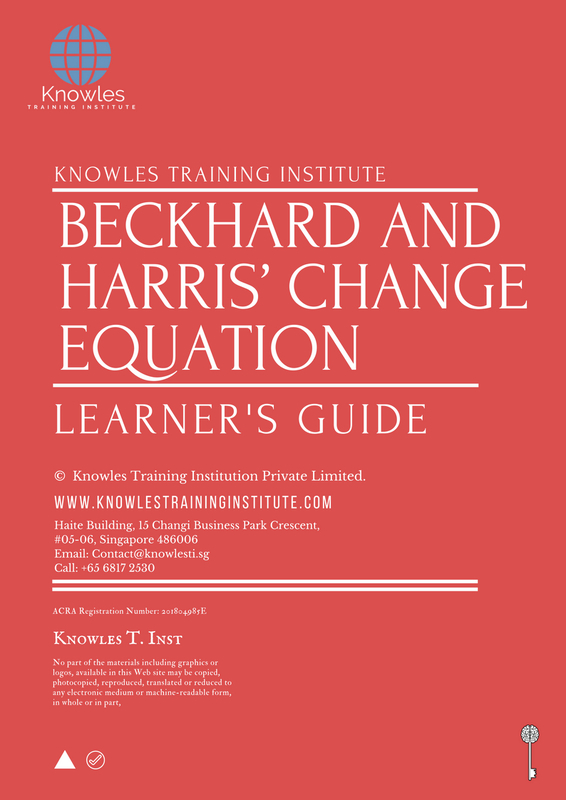 • What is the Beckhard and Harris change equation (or formula of change)? • How is this equation applied in business? 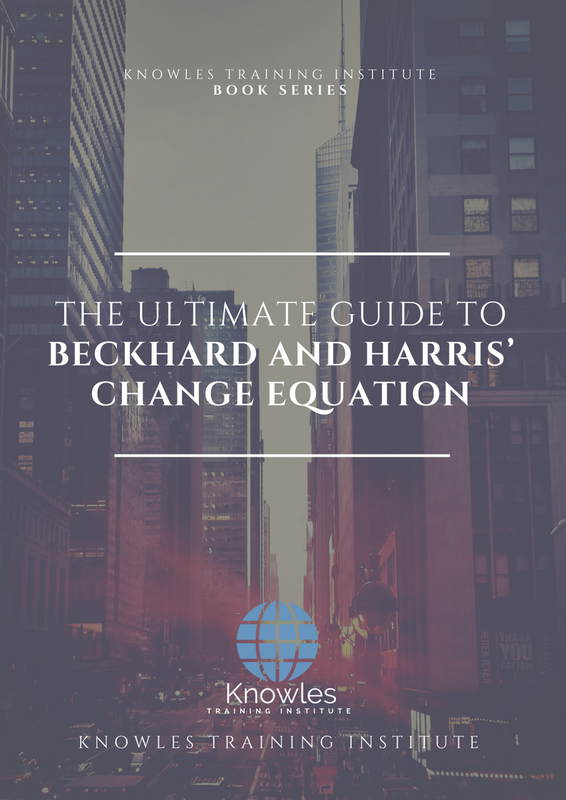 • What are the benefits of using the Beckhard and Harris change equation? 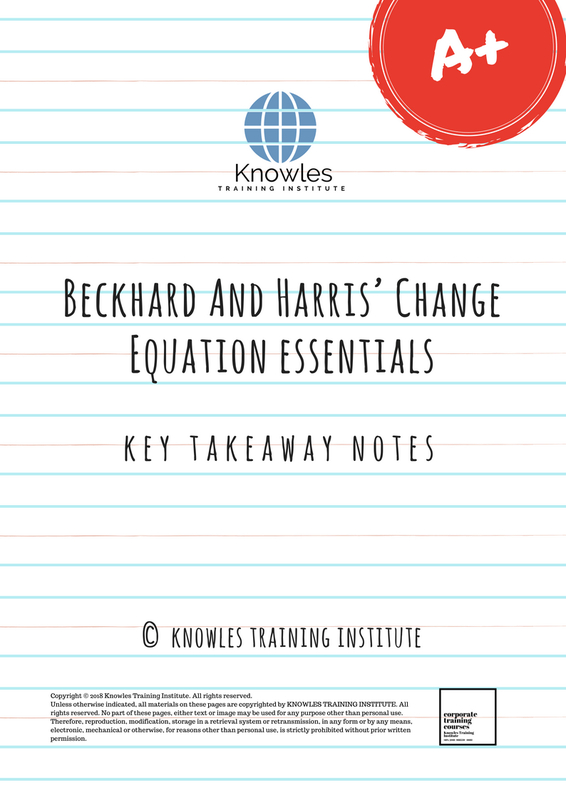 • What are the risks and limitations of using the Beckhard and Harris change equation? • Activity: What are the changes that need to happen in your workplace or society in general? Can the Beckhard and Harris change equation be applied to it? 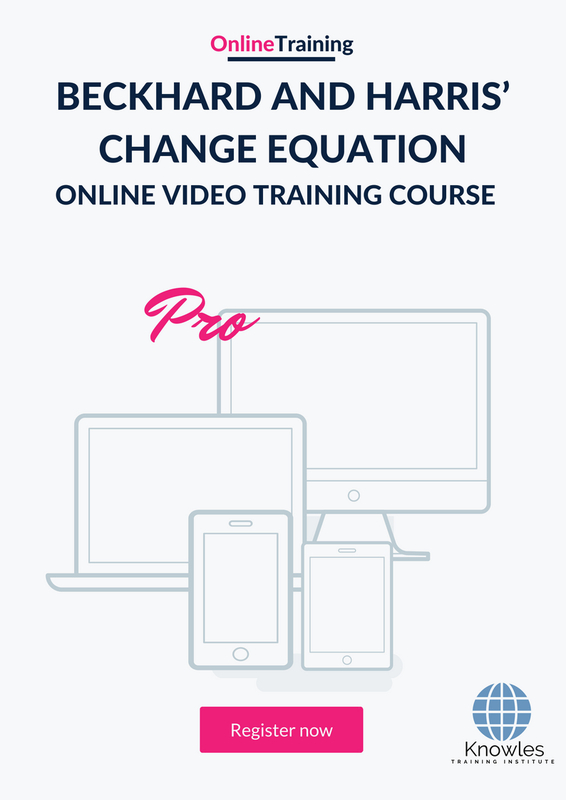 There are 3 pricing options available for this Beckhard And Harris’ Change Equation training course. 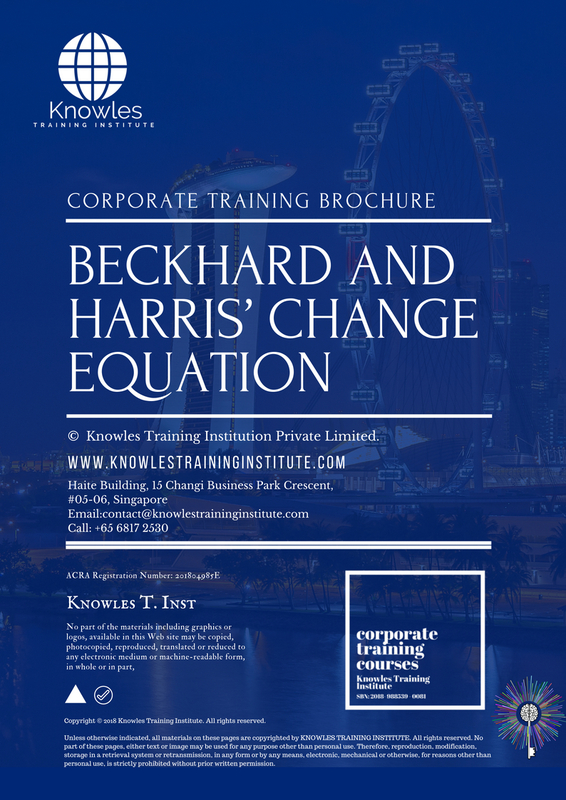 Course participants not in Singapore may choose to sign up for our online Beckhard And Harris’ Change Equation training course. 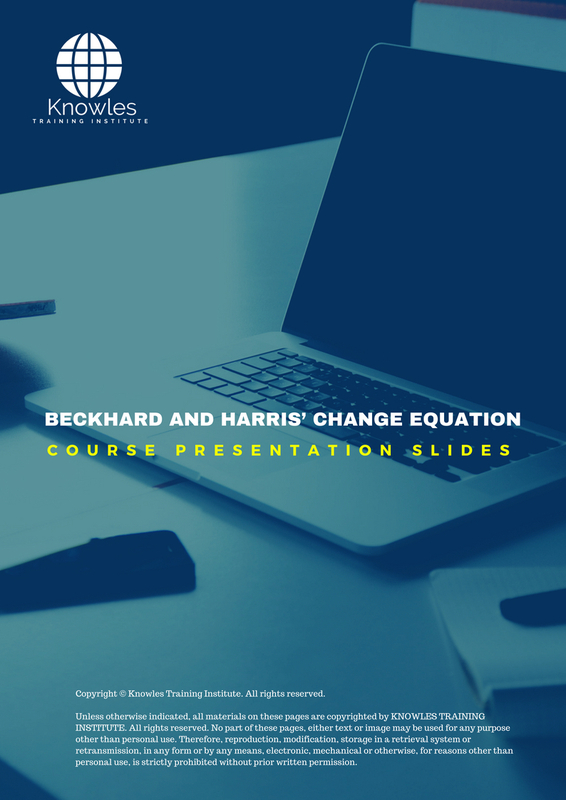 Request for this Beckhard And Harris’ Change Equation course brochure. Fill up the short information below and we will send it to you right away! 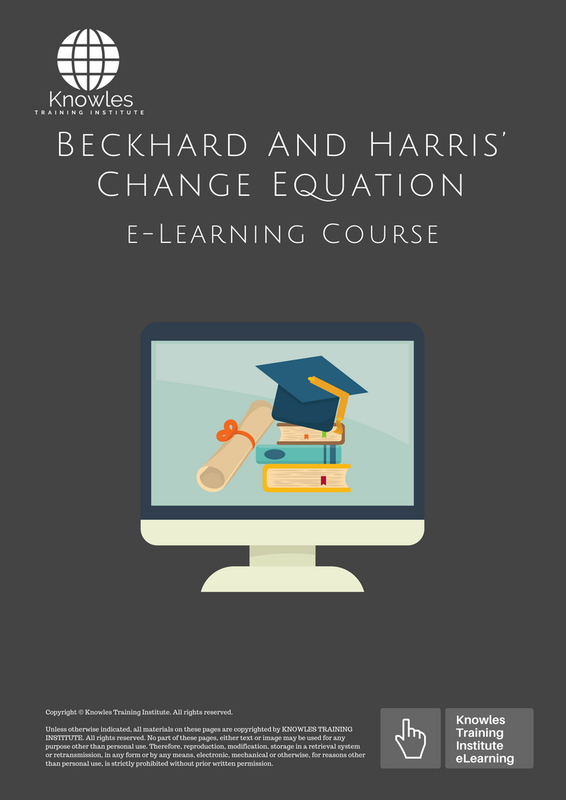 Register For This Beckhard And Harris’ Change Equation Course Now! 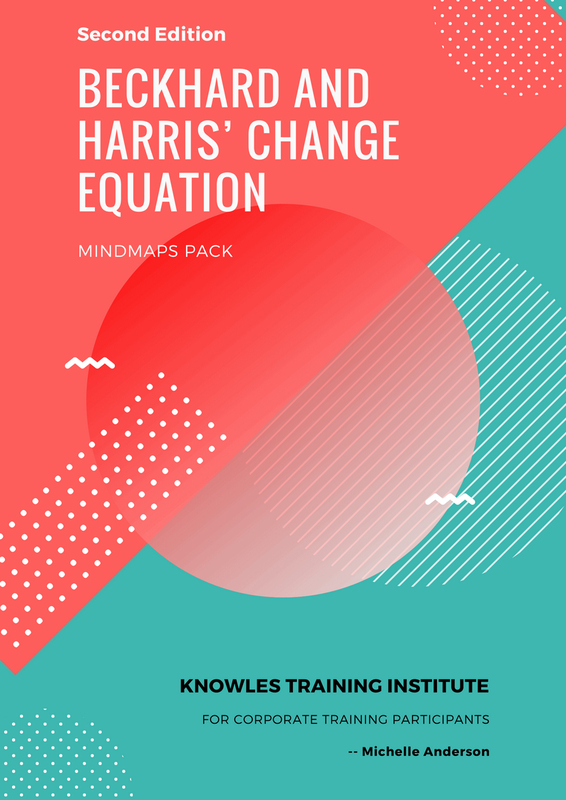 Share This Beckhard And Harris' Change Equation Training Course! 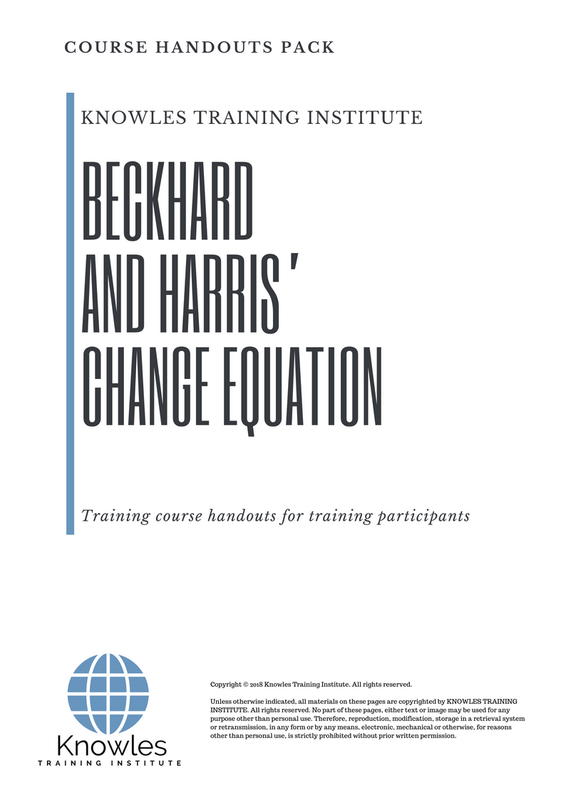 Beckhard And Harris’ Change Equation course, workshop, training, class, seminar, talk, program, programme, activity, lecture. 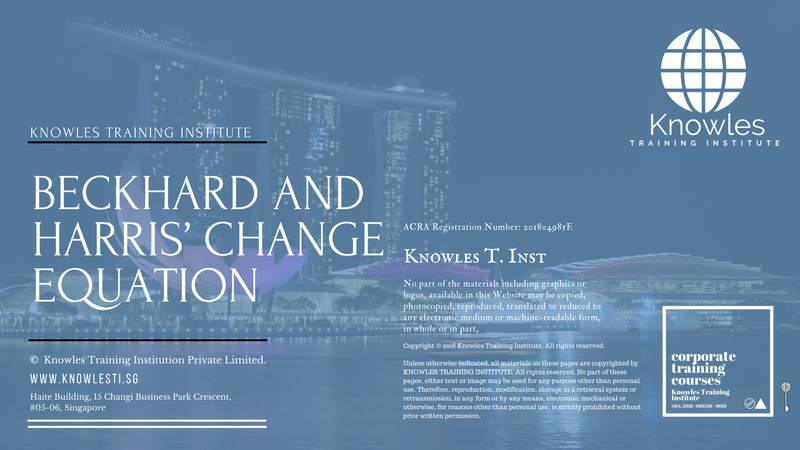 Beckhard And Harris’ Change Equation courses, workshops, classes, seminars, talks, programs, programmes, activities, lectures in Singapore. Beckhard And Harris’ Change Equation improvement tips, Beckhard And Harris’ Change Equation techniques, improve Beckhard And Harris’ Change Equation, improve Beckhard And Harris’ Change Equation games, Beckhard And Harris’ Change Equation improvement exercises, improve Beckhard And Harris’ Change Equation power, how to have good Beckhard And Harris’ Change Equation, how to have good Beckhard And Harris’ Change Equation in studying, how to build up your Beckhard And Harris’ Change Equation, how to improve Beckhard And Harris’ Change Equation how to improve Beckhard And Harris’ Change Equation course in Singapore. Enhance, boost, build up, enlarge, heighten Beckhard And Harris’ Change Equation course in Singapore. Increase, intensify, raise, reinforce, strengthen Beckhard And Harris’ Change Equation. Upgrade, amplify, boom, elevate, exaggerate, magnify, grow, gain Beckhard And Harris’ Change Equation. Develop Beckhard And Harris’ Change Equation, multiple, power up, beef up, bolster, establish, extend Beckhard And Harris’ Change Equation. Invigorate, restore, step up, toughen, empower, fortify, regenerate Beckhard And Harris’ Change Equation. Rejuvenate, renew, escalate, expand, maximize Beckhard And Harris’ Change Equation. Powerful, mighty, impressive, competent, great, excellent, exceptional Beckhard And Harris’ Change Equation in Singapore. Superb Beckhard And Harris’ Change Equation. 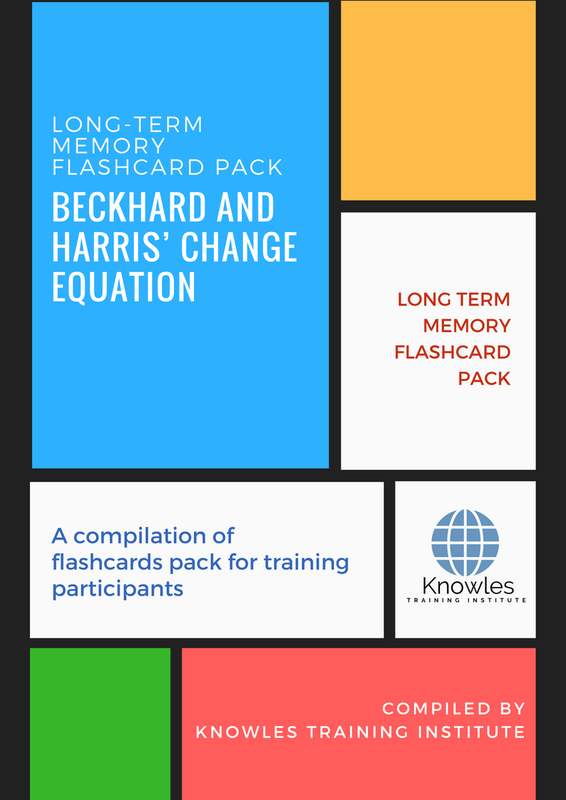 Super, superior, strong, solid, active Beckhard And Harris’ Change Equation training courses and workshops in Singapore. Beckhard And Harris’ Change Equation enhancement, booster, building up, enlargement, heightening, increment, strengthening, amplification. Beckhard And Harris’ Change Equation magnification, growth, development, power, empowerment, regeneration. 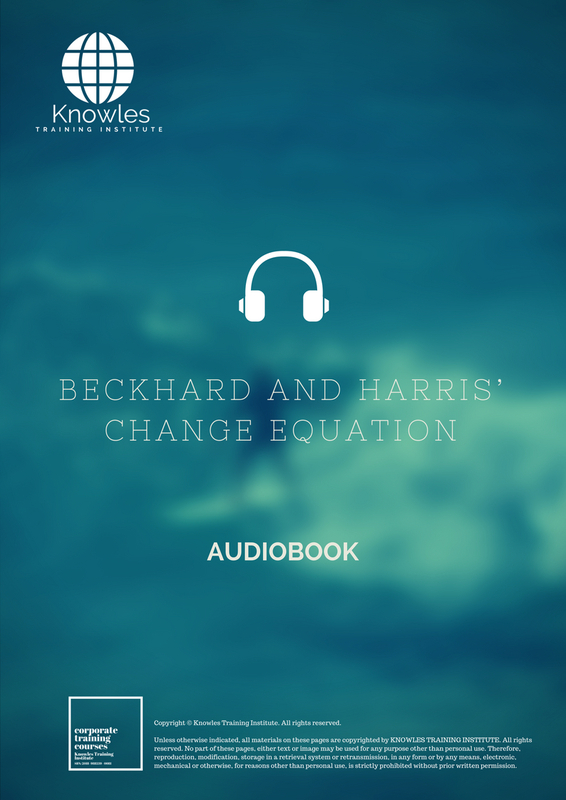 Beckhard And Harris’ Change Equation rejuvenation, development, escalation, expansion. 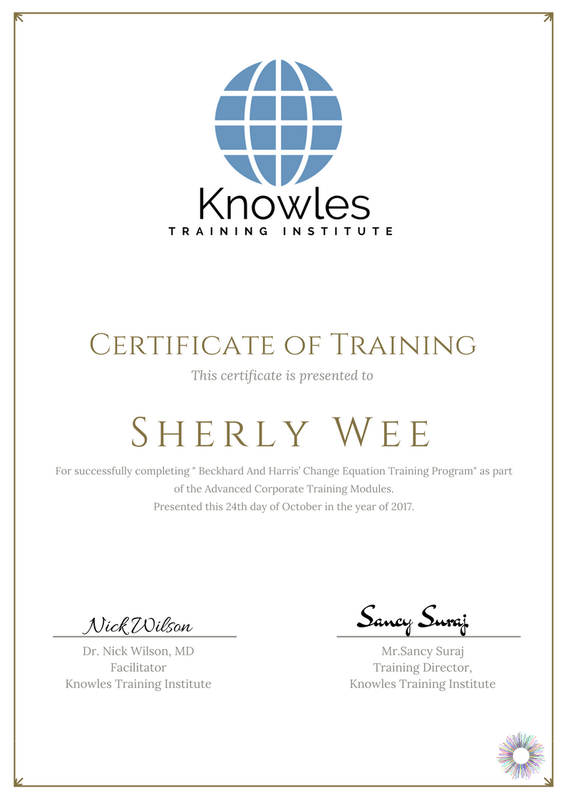 Beckhard And Harris’ Change Equation maximization, power training courses & workshops in Singapore.